Hosannah: I HAVE COMPLETED LESSON 8! Today, the 14th of September, I have completed LESSON 8!! Have you been trying it quiet lately? Is it a fun and learning game for you? 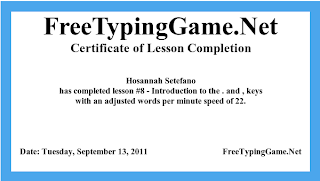 Go to google and search "FREE TYPING TUTOR." I know you will have some difficulty but, it helps you learn and type faster.